Carefree has a great new contest! The contest is called "Free To Be You" and it's about how important that is. There are lots of instant win prizes up for grabs plus a freebie (read below on how to get that!). Please note this bonus freebie! - Once you've entered the contest, you will be directed to a sign up page to enter to win that prize, click on the top right and corner on the green triangle. That green triangle will take you to a coupon to claim a Free Carefree Liner from a hidden Save.ca coupon portal. 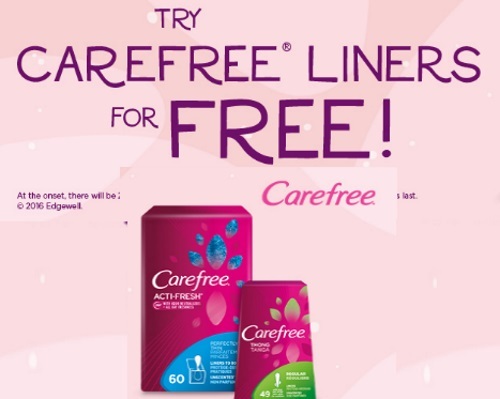 This is a mail coupon, valid on any 36-60 Count Carefree Liner Packs. There are only 20,000 coupons available, 4000 are available to thsoe in Quebec. While quantities last. Limit 1 entry per person per day Contest closes October 26, 2016.